Two whistleblowers voluntarily provided original information to the SEC in the same SEC whistleblower case. Their information led to the successful enforcement of the SEC’s action. In its Preliminary Determination, the SEC’s Claims Review Staff (“CRS”) did not recommend that they receive separate SEC whistleblower rewards. Instead the CRS recommended that the two whistleblowers receive a joint SEC whistleblower award. The two whistleblowers sent a written notice to the SEC stating that they were not going to contest that determination. In a footnote, the Commission directed the SEC’s Office of the Whistleblower “to pay each of the Claimants individually 50% of their joint award”. While the Order was sparse on details, a press release about the joint SEC whistleblower award shed a little more light on the assistance that the two whistleblowers provided. 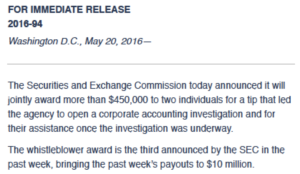 According to the press release, the two whistleblowers provided “a tip” to the SEC. That tip led the SEC “to open a corporate accounting investigation”. The press release also stated that the whistleblowers provided “assistance once the investigation was underway”. 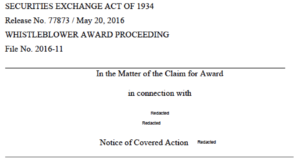 The joint SEC whistleblower award was the third reward granted in that same week. The Chief of the Office of the Whistleblower commented that “The recent flurry of awards reflects the high-quality nature of the tips the SEC is receiving as public awareness of the whistleblower program grows”. He went on to state that the joint award shows that the SEC whistleblower program “particularly rewards those eager to continue helping us throughout the process of bringing an enforcement action”.